Below is discussion of Internet domain name structure including top level domain, second level domain, and sub domain as domain name structure elements. Domain name rules are applied to generate valid example names. A Top Level Domain (TLD) is a registry entity and its name is the name of the group to which its member-names are registered. The "dot" ( . ) is a period character and is an element of domain name structure which is used to mark the separation of the various name elements of a domain name. For example, "NET" is a top level domain name and "INTERCLIX" is second level domain name. We would speak of INTERCLIX as being a member of the "dot NET" top level domain, such as "Interclix dot NET". Note that all Internet domain names follow the same rules for domain name structure. The organization that manages the range of domain names is ICANN (Internet Corporation for Assigned Names and Numbers). 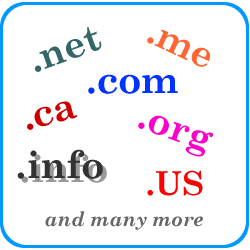 This group establishes the names of the top level domains that exist. Each TLD name comprises a registry, where member domain names are registered. Some of the TLD name registries that ICANN has established are reserved for special uses, such as .EDU for colleges and universities, and .MIL for military use only, and .GOV for use by various government entities. This is not an exhaustive list, but there are some other top level domains that are reserved and for which a regular person or company can't register their Second Level Domain name. No matter, you probably aren't going to start your own country, either. you would then also need to choose a top level domain in which to get your name registered. When a second level domain name gets registered, it becomes a member of a particular TLD. Let's say that you already knew that you wanted to become part of the .COM crowd, so you will need to find out if anyone else has also had this bright idea AND already registered the same name that you want. You are probably not concerned with whether someone else has also had this idea for a name, but you are concerned with whether they have registered the domain name: The answer to the latter is likely your main concern here. Some clarity for purposes of human reading might be in order for your domain name(s). Among the character set for domain names is the hyphen ( - ) character. You can use a hyphen character to improve clarity for reading. Know also that by adding one or more hyphen characters makes the name an entirely different second level domain name. ... and consider what seems will work best for your project. Think about whether your web site visitors will need to type in your domain name (shorter names are easier to type), or will it be primarily linked to from somewhere else. Consider also read-ability and available space for printing on business cards, stationery, and advertising or packaging materials if those will be elements of your endeavor. A sub domain (also known as: subdomain) is a name typically assigned to a server that operates within the addressing scheme of SECONDLEVELDOMAIN.TOPLEVELDOMAIN . Probably the most familiar and commonly used sub domain name is "WWW". Domain-name name elements are counted from right to left. A sub domain is a possible and optional third name element associated with a larger domain name, such as WWW.INTERCLIX.NET . Note that when used, such as in a URL, the sub domain name is always separated from the second level domain name by only one "dot" or period (.). WWW is commonly the default subdomain name that is set up for a web server. In order to be valid it must be defined and assigned among the DNS records of its parent second level domain name. Usually this step is done for you by your website hosting service. Depending on the level of control you have of your DNS records and webserver, you could have a different subdomain name for your webserver, or perhaps several subdomain names for various other servers, such as a mail server or data base server; and / or multiple webservers, such as WWW and WWW2, WWW3, etc. In a DNS record, a sub domain name will point to a physical server or a logical resource that appears to a web browser as a unique physical or logical server. The rules for naming a sub domain are the same as for Second Level domain names, as mentioned above.